President Donald Trump’s threat to shut down the southern border raised fears Monday of dire economic consequences in the U.S. and upheaval of daily life in a stretch of the country that relies on the international flow of not just goods and services but also students, families, and workers. Politicians, business leaders, and economists warned that such a move would block incoming shipments of fruits and vegetables, TVs, medical devices, and other products and cut off people who commute to their jobs or school or come across to go shopping. The nation’s dairymen vociferously criticized the president’s threat. In 2018, a record 15.8 percent of U.S. milk production was exported. Mexico was the largest single customer for U.S. dairy exports, with sales of $1.4 billion. The impact would be even bigger on California dairies. Half of the state’s dairy exports go to Mexico. In a statement released by his office, Rep. TJ Cox (D-Fresno) blistered the president for talking about closing the U.S. border with Mexico. “If Mexico doesn’t immediately stop ALL illegal immigration coming into the United States through our Southern Border, I will be CLOSING … ….the Border, or large sections of the Border, next week,” Trump tweeted. Mexico is one of the United States’ most important trading partners, ranking second among U.S. export markets. In California’s Imperial Valley, across from Mexicali, Mexico, farmers rely on workers who come across every day from Mexico to harvest fields of lettuce, carrots, onions, and other winter vegetables. Shopping mall parking lots in the region are filled with cars with Mexican plates. More than 60 percent of all Mexican winter produce consumed in the U.S. crosses into the country at Nogales, Arizona. The winter produce season is especially heavy right now, with the import of Mexican-grown watermelons, grapes, and squash, said Lance Jungmeyer, president of the Fresh Produce Association of the Americas. 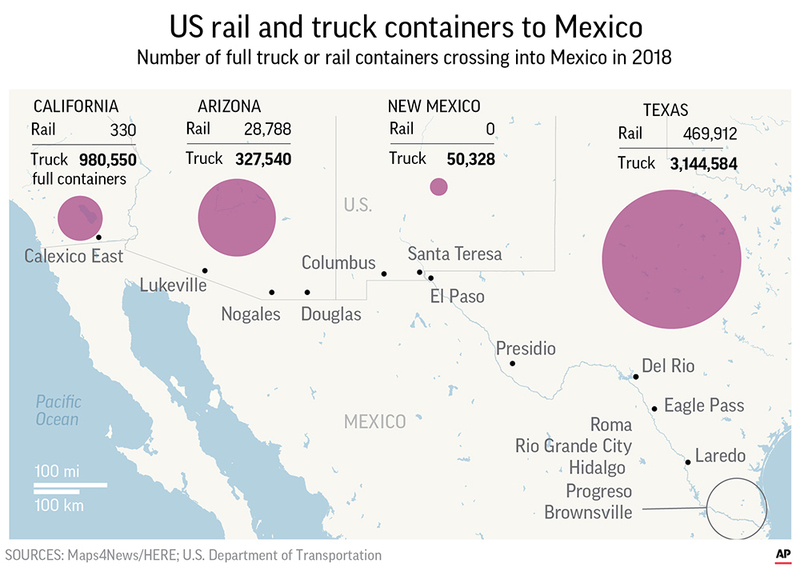 He said 11,000 to 12,000 commercial trucks cross the border at Nogales daily, laden with about 50 million pounds of produce such as eggplants, tomatoes, bell peppers, lettuce, cucumbers, and berries. “Closing the border would cause an immediate depression in border state communities and, depending on the duration, a recession in the rest of the country,” he said.”Our business would end,” said Marta Salas, an employee at an El Paso shop near the border that sells plastic flowers that are used on the Mexican side by families holding quinceañeras, the traditional coming-of-age celebrations. When will those who voted for Donald Trump for President realize what a disaster he is for our country and the world?